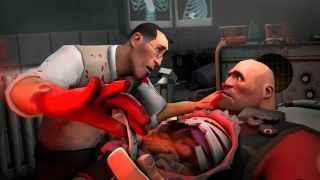 Team Fortress 2 would probably work as a musical, but, unless Valve has something spectacular planned for the game's ninth year, we'll have to make do with this mod. Created by 'Vincentor', it replaces every piece of dialogue in the game with exactly the same piece of dialogue, only auto-tuned. The mod covers all vocals—including every class, NPC and the announcer. To install, just download the mod and extract it into "tf/custom" folder inside your Team Fortress 2 root directory. You'll have to supply the house backing track yourself.